In recent years, several studies have explored the (typically) negative relationship between statistical measures of uncertainty and economic data such as GDP or business investment, and often asserted that increases in uncertainty cause large falls in economic activity. However, these studies have potentially conflated notions such as volatility, pessimism and predictability and have typically relied on a narrow set of variables to derive uncertainty indicators. In a recent paper, Jurado, Ludvigson and Ng (2015), hereafter JLN, propose an uncertainty proxy that captures when the economy has become less predictable (i.e., forecastable) and when that decline in predictability applies to many macroeconomic time series, thus addressing some of the shortcomings of earlier approaches. To do this, JLN construct a large dataset of US macroeconomic and financial variables and use a model to forecast each one of them. The forecast errors vary over time, and their standard deviation can be used as a proxy of uncertainty (taken to mean unforecastability) for each time series. We use one period ahead forecast errors. The uncertainty indices are the averages across different groups of macroeconomic and/or financial time series of these time-varying standard deviations. This approach allows us to produce an uncertainty index in real time so long as all the underlying series are available. We apply the same idea to UK data: we construct a monthly dataset of 29 financial and 34 macroeconomic series spanning June 1991 to July 2016 for the U.K. and follow JLN’s methodology to extract real and financial indices that span the two classes (Figure 1). While at low frequencies real and financial uncertainty tend to move together, at higher frequencies they display substantial differences. Our uncertainty measures differ substantially from other popular approaches and can yield a different read on which periods are associated with high uncertainty. For example, Figure 1 reports the measure developed at the Bank of England, which summarises a small number of underlying series that measure volatility in financial markets, forecaster disagreement, survey measures of consumer and business confidence and the number of media reports citing uncertainty. While both the measure constructed by Bank staff and the JLN real uncertainty index spike during the financial crisis, the JLN index suggests less uncertainty around the ERM crisis in 1992, and more uncertainty in the early 2000s, with spikes that are relatively minor or absent in the other measure. 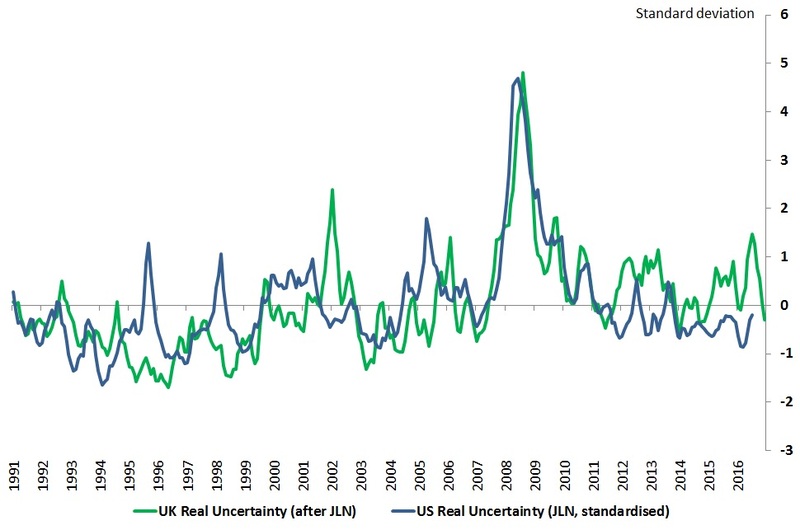 Also, unlike the Bank staff measure (and the JLN financial uncertainty index in Figure 1), the JLN real uncertainty index is consistent with the stability of the UK’s real economy around that period (although the measure did spike a few months later). That is consistent with the resilience of the UK’s real economy around that period, despite increased volatility in financial markets. Earlier empirical studies of uncertainty also struggled with the fact that increased uncertainty often reflects other events, rather than being an independent development, especially if the uncertainty measure used relies on financial market variables. To overcome some of these issues, we apply a novel method of establishing causation (referred to in the literature as an ‘identification strategy’) developed by Ludvigson, Ma and Ng (2017), henceforth LMN, to estimate the causal impact of various types of uncertainty on UK real economic activity. The underlying model, a simple Vector Auto-Regression containing the two uncertainty series (real and financial) and a measure of real activity (industrial production) is admittedly very stylised, but the strength of LMN’s identification strategy lies in using additional external information to pin down the causal impact of uncertainty shocks. Identification in LMN rests on two ideas: first, uncertainty shocks (both about real and financial variables) ought to be reflected in stock prices. For example, greater real uncertainty around GDP growth should be reflected in lower valuation for UK firms. Second, uncertainty shocks should be large and positive during historical episodes where uncertainty is deemed (a priori) to have played a genuinely causal role in driving the economy: for example, in our application to the UK we require financial uncertainty shocks to be large around the ERM crisis in 1992, during the great financial crisis of 2007-2009. Taken together, these are sufficient to disentangle the effects of different types of uncertainty shocks, and to distinguish them from other sources of macroeconomic fluctuations (which, in our model, are simply captured by a residual shock). Figure 3 shows the model’s responses to two types of uncertainty shocks: a “real uncertainty shock” and a “financial uncertainty shock”. The shocks are scaled to yield 1% increases in the macro uncertainty and financial uncertainty indices on impact, respectively. We find two main results. 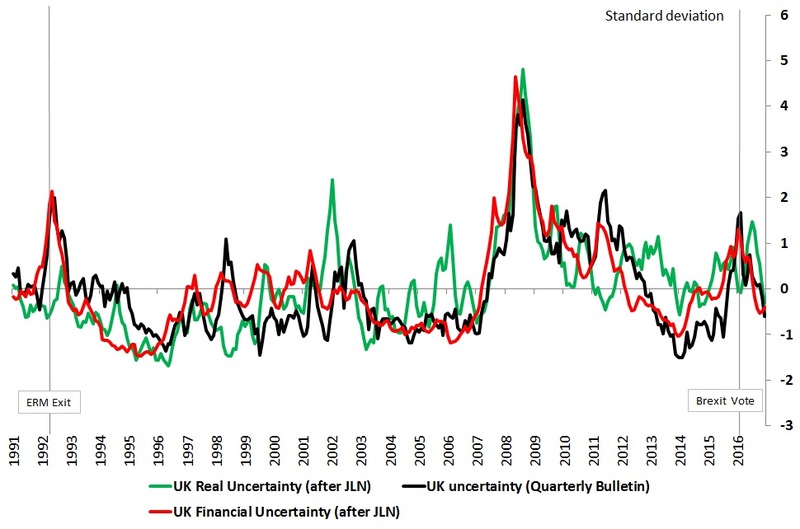 First, real uncertainty shocks have no discernible impact on either real activity or the financial uncertainty measure (top three panels – data are at a monthly frequency). 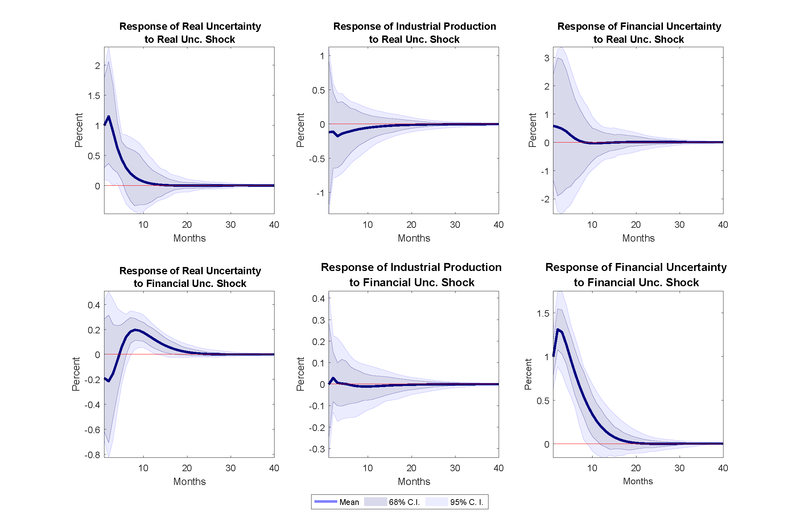 Second, financial uncertainty shocks appear to feed through to real activity within about a year, with a peak impact of around -0.2% on industrial production, and with an increase in real uncertainty as part of the transmission channel (bottom three panels). This impact is not negligible: a one standard deviation financial uncertainty shock would depress industrial production by around 2.5%, and the level of GDP by roughly 0.4% (a crude estimate based on the share of industrial production in UK value added). Thus, on the face of it, financial uncertainty shocks appear to depress real activity, and also to cause uncertainty about the real economy to rise. The story, however, might not be so straightforward. Figure 4 and Figure 5 plot the UK uncertainty series alongside their US analogues estimated by JLN; both sets of series are highly correlated. The correlation coefficients are 0.68 and 0.7 for real and financial uncertainty, respectively, which suggests there might be common shocks driving the series in both countries. Indeed, a growing body of empirical evidence shows that financial (and to a certain extent real) variables are highly synchronised across countries and largely driven by global shocks – a fact that is particularly true of small open economies such as the United Kingdom. If this is the case, then our UK uncertainty measures can be decomposed into two components: one that is due to movements in global uncertainty, and another due to country-specific uncertainty. These two components could have different effects on UK GDP. We therefore seek to isolate genuinely UK-specific uncertainty shocks from global ones in the simplest possible way, by controlling for foreign variables in our model. We do that by including in the VAR two measures of US financial and macroeconomic uncertainty, and also a series for US industrial production, thus taking into account both financial and real linkages (we use US variables to approximate global ones for simplicity). Figure 5 shows the same impulse responses to UK-specific shocks, but this time controlling for US variables. 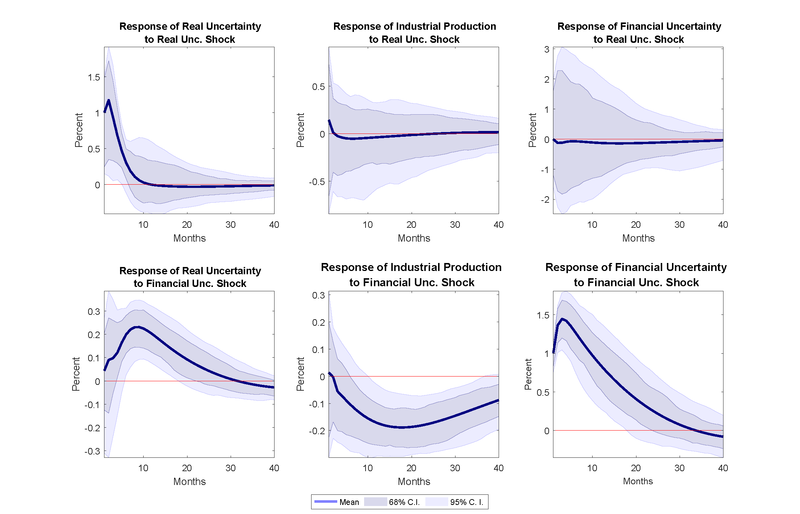 While there is little difference for real uncertainty shocks, the bottom three panels clearly show that, once we control for external factors, UK-specific financial uncertainty shocks no longer have any discernible effect on real activity. Similarly, in ongoing research using a richer model of the world economy and an alternative identification approach, Cesa-Bianchi Pesaran and Rebucci (2017) find that country-specific measures of uncertainty are largely driven by global factors, and that it is this global component that can explain some of the cyclical variation in economic activity. It could also be the case that country-specific uncertainty is automatically offset by changes in the exchange rate, or deliberately by a change in monetary policy. We presented two new measures of UK economic uncertainty computed using state-of-the-art techniques that address a number of known issues with existing uncertainty indices. Our measures, just like most existing ones, are strongly counter-cyclical: they tend to rise during recessions and fall during economic upswings. But interpreting this correlation in economic terms is challenging, because causation can run both ways. 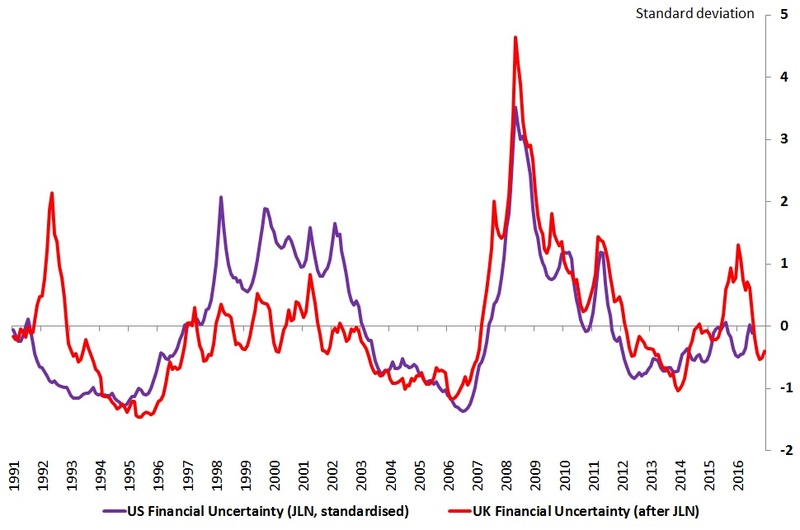 We therefore employed a recently developed technique to quantify the causal impact of uncertainty shocks on real activity, and found that increases in our new measure of UK financial uncertainty can have a negative impact on UK real activity. However, we then took into account that country-specific uncertainty measures share a large global component, and attempted to disentangle global and UK-specific uncertainty shocks. We found that UK-specific uncertainty shocks have not forecast real activity in the UK to a large extent. This could be because they do not drive activity, or because monetary policy or the exchange rate have been able to offset them. Ambrogio Cesa-Bianchi works in the Bank’s Macro-Financial Analysis Division, Chris Redl works in the Bank’s Monetary Analysis Division, Andrej Sokol and Gregory Thwaites work in the Bank’s Global Spillovers and Interconnections Division. Next Post Do investors amplify or cushion corporate bond market sell-offs? Simply its Social Mood that effects economy, attitudes and Markets. Positive Mood things are fine but a change of Social Mod to Negative spells trouble for the Economy, Markets. Gov’ts and etc. Simply go back in time and graph Social Mood and Mkts and Economy and you will see it moves in WAVES over long history back to the 1700’s. 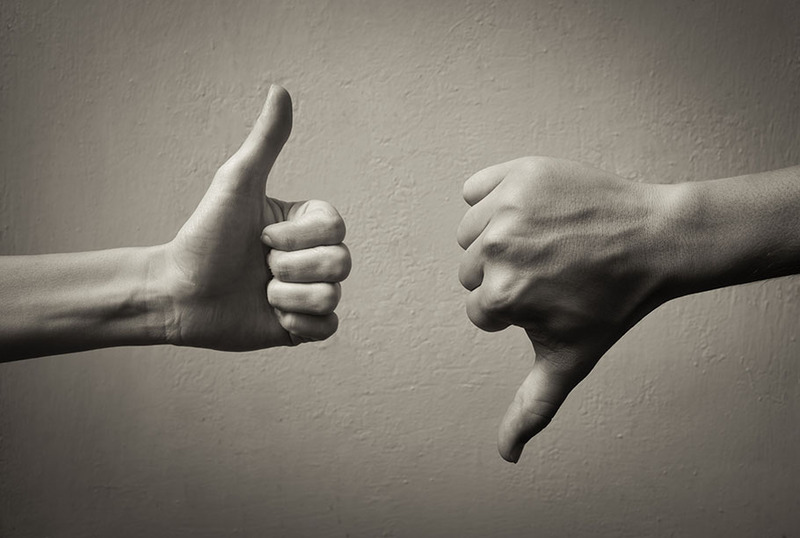 We are now in a change of mood from Positive to Negative and in many cases in Negative Social Mood, this will have it effects on the MKTS going forward. Interested enough to see some if the foundational basis of correlations. Note: USA stocks only have a 60% to 70% correlation to business fundamentals. Correlations above this level may encounter the secondary chaotic effects of economic meaures.